Do you need help to Claim Surplus Funds? Many people think that foreclosure is the end of a lost battle and they don’t know what happens after foreclosure. If you are someone who lost your home due to foreclosure, then you might still have a chance to get something back from your old home. If your home was sold at a foreclosure auction with equity remaining, you are entitled to a check for money that is left over from the sale of the house. That amount is known as mortgage foreclosure surplus funds. The surplus funds are what the previous homeowners can claim after the house is auctioned and paid by the winning bidder. Foreclosure can be a frustrating experience but the excess funds that you can get from the sale can help ease your burden and can be used to pay for your rent or as a down payment for a new home. The amount that you can get from mortgage surplus funds depends on how much was owed to the lender and the selling price of the house. Surplus funds are computed by subtracting the outstanding mortgage balances from the sale price paid by the bidder, including any/all fees and penalties incurred by the property. In other words, surplus funds are the difference between the selling price and the outstanding balance. In California, the law states that any excess funds go to the most recent owner of the foreclosed property. If there is another party that lays claim to the property such as on the case of a second mortgage, then the surplus funds will be used to pay off the debt and the amount left can be claimed once secured liens are paid off. If you need help in getting back the surplus funds from your foreclosed property, you should consult with a professional law firm experienced in recovering excess fund from foreclosed properties. Consumer Action Law Group has helped many victims of foreclosure to recover their surplus fund and sometimes in rare cases, we helped clients get their home back after an illegal foreclosure. Our law firm will navigate the process and deal with the courts and the trustee without charging you any fees up front. Call us and talk to one of our experience foreclosure surplus funds attorney for free to start your surplus fund claim right away; delay can be very costly. We will contact the trustee for you and handle all the complicated paperwork to get your money back. We know that our clients have already been through a tough battle, but the good news is there is hope and you can recover your surplus funds. 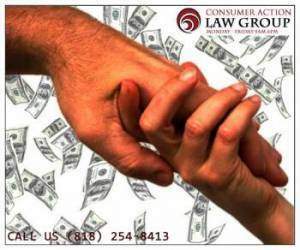 You are entitled to the excess proceeds and we can help you get them back. Call us today. Were Your Home Sold in a Foreclosure Auction? Call Us Today. You might be entitle to Foreclosure Surplus Funds.